Modern Jiu-Jitsu legend Bruno Frazatto is one of the most active competitors of his generation and has paved the way for many of the young rising stars of BJJ. In his first ever feature-length English language instructional series, Bruno Frazatto expertly teaches you his favorite guard passing techniques. These battle-tested guard passes are staples in his overall game and have helped him solidify his legacy as one of the best featherweights in Brazilian Jiu-Jitsu history. In addition to technique, he talks about timing, strategies, and concepts that will help improve your passing skills. 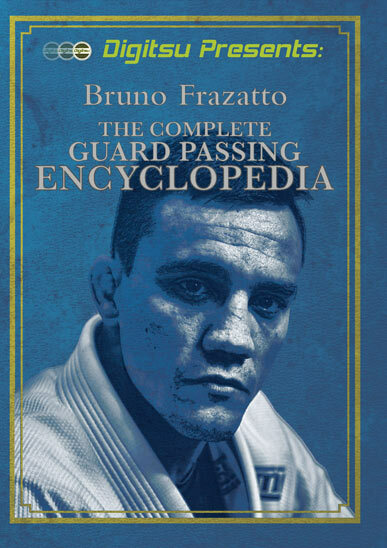 THE COMPLETE GUARD PASSING ENCYCLOPEDIA is broken up into chapters so that it’s easy to follow and navigate. Unleash your inner guard passing beast! I've had the opportunity to train with Professor Frazatto on several occasions. He has one of the most technical games around. In a world where some have a very technical bottom game and others, a very technical top game, professor Frazatto has both! This instructional video is one of the most complete and detailed videos on guard passing! Drill the crap out of the techniques in this video, and it will be guaranteed to increase your guard passing percentages! Pick it up today and become a guard passing machine!